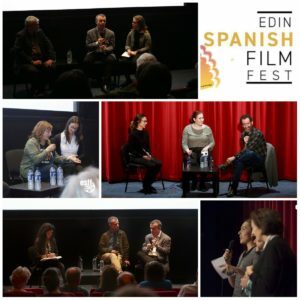 As the curtain falls on the 2017 Edinburgh Spanish Film Festival (ESFF), it is time to look back at 10 days of great films, fine Spanish food and interesting Q&A sessions with actors, directors and producers. It is also a good time to celebrate yet another successful collaboration between the ESFF and LINCS. Our interpreters have participated in several festival screenings and have played an important role in enabling communication among everyone attending the festival, regardless of their language skills. At LINCS we are extremely proud of this cooperation and we hope to be part of the festival again in 2018! The Translating the Deaf Self project: Wrapping up and what’s next? Click here to see a BSL version of the blog, presented by Rosemary Oram. In two previous LifeinLINCS blog posts in March 2016 and August 2016, we have provided an overview of our Translating the Deaf Self project. The AHRC Translating Cultures research innovation grant for this project has meant that we have been able to carry out a scoping study of an area that has not yet been explored in the literature of Deaf Studies, Interpreting Studies, Applied Sign Linguistics or Applied Social Research. Our research focused on what it is like for Deaf sign language users to be known largely through translation and what the consequences might be for wellbeing. How is translation constitutive of Deaf cultures in their formation, projection and transformation? What is the impact of consistently experiencing existence to others as a translated-self on personal identity, achievement and well-being? The experience of consistently experiencing existence to others as a translated-self has an impact on personal identity, achievement and well-being for Deaf sign language users. That impact is not always positive but it is recognized by Deaf people some of whom make deliberate adjustments in everyday life to combat negative effects and maximize the positive. Interpreters too are professionally conscious of their role in the ‘translated Deaf self’ and the dilemmas it brings up in terms of representation to others. From hearing people’s point of view in workplace relationships with Deaf colleagues, representation and identity are obscured often by a fascination with the interpreter. Even when hearing colleagues attempt to ‘get past’ the interpreter and seek out what they perceive as the ‘real’ Deaf person they can miss the important point that the Deaf person and their language are not inseparable. There is no hidden self ‘despite’ an interpreter. As this project was a new exploration of this concept, it is clear that more research is needed on this topic. We are in the process of writing up our findings, and will submit them for publications. Oram, R., Napier, J., Young, A., & Skinner, R., (2016). Critical links between Deaf culture, well being and interpreting: Translating the Deaf Self. Poster presented to the Critical Link 8: Interpreting in the Community Conference, Edinburgh, 29 June – 1 July 2016. Napier, J., Oram, R., Skinner, R., & Young, A. (2016). Translating the Deaf Self: Deaf culture in practice and being ‘known’ through interpreting. Association of Sign Language Interpreters UK Conference, Newcastle, 1-2 October 2016. Napier, J., Oram, R., Young, A., Skinner, & O’Connell, N. (2016). Translating the Deaf Self: An example of innovation in university-community research engagement. Bridging the Gap conference, Brighton, 12th November 2016. Napier, J., Young, A., Oram, R., & Skinner, R. (2017). Translating the Deaf Self: The lived experience of being ‘known’ through interpreting. Symposium on Sign Language Interpreting & Translation Research, Gallaudet University, Washington, DC, March 2017. In collaboration with two Deaf-led production companies, AC2.Com and Mutt & Jeff Pictures, we produced three short films in BSL to encapsulate some of the key themes that had come up in our data. The films are not an attempt to summarise the findings, but to highlight some key issues that our participants discussed, which we can use to generate more conversations about the concept of the ‘Translated Deaf Self’. We have not yet made the videos public via social media as we are concerned about how people might respond and the potential impact on wellbeing if any content of the videos triggers emotive responses and we cannot be present to talk through those responses. Instead, we have decided to only show the videos when a member of the research team is present to explain the background, contextualise the study and the videos, and is available to talk through responses. But each film has been submitted to the Deaf Fest 2017 Film Festival in the UK, so we hope that they will be shown there. In September 2016 we hosted an event in collaboration with Action Deafness and the Derby Deaf Club, where we had approximately 75 participants who travelled from all over the country to learn about what we had found in the study, and to participate in a preview of the films. As part of the event, we also had follow up discussion in BSL about how the participants responded to the films and whether they identified with the themes in each film. Showing the films generated a lot of interesting discussion, and has confirmed for us the importance of taking the films around the country to show the British Deaf community. We plan to apply for further AHRC funding to explore the notion of the Translated Deaf Self in more depth, and hope to continue the partnership with all the people and organisations who were involved in this scoping study. We also plan to apply for AHRC Follow-on Funding for Impact and Engagement in 2017 in order to disseminate the findings and show the videos via a ‘roadshow’. Craig Crowley, CEO; Jaz Mann, Alison Blount at Action Deafness for support with organising Community Participatory Group in Leicester and with film launch event in Derby, and Action Deafness for providing interpreters for the film launch event at no cost to the project. Emmy Kauling for help compiling the final research report. You’ve seen their work, now find out more about what they do: subtitling.